Includes HUD and RIC/UAC with carbon or aluminum cylinder and 20/20 face-piece. The rugged and durable SURVIVAIR Panther SCBA provides dependable protection with incomparable comfort. Now with a reliable, wired Heads-Up Display (HUD) and Rapid Intervention Crew/Company Universal Air Connection (RIC UAC), the SURVIVAIR Panther provides the most advanced protection available in a self-contained breathing apparatus. 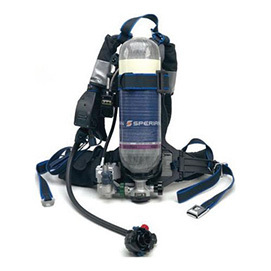 Need a price on Reconditioned Survivair Panther 2002 NFPA SCBA's?